NOTES: Easy conversion. Eduard photoetched seatbelts, Squadron vac. canopy, and LaGG 3 prop and spinner used. The Yak-7 series of aircraft was developed from the Yak-1 fighter. The first of the Yak-7 line, the Yak-7UTI was developed as a dual seat trainer based on a stretched Yak-1 airframe. When it was found that the trainer had better flying characteristics than the fighter, the Soviets simply armed the trainer, removing the rear seat and placing a plywood cover over the rear canopy. 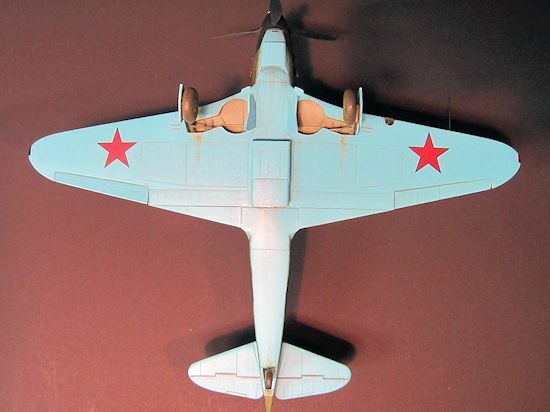 This lash-up fighter was the Yak-7B. The Yak-7B would be the basis for the more advanced Yak-7DI and Yak-9 fighters. 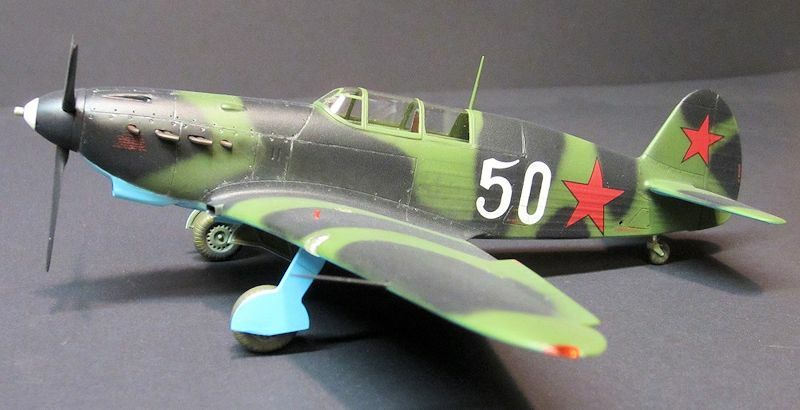 Many Soviet Aces flew the Yak-7B, including Lt. Col. A. E. Golubov of the 18th IAP (Fighter Aviation Regiment). This kit originated in the 1990s. Released by ICM, the kit is notable for its soft, greasy plastic, basic detail, ghastly prop and spinner, T-34 (yes, the Soviet tank!) inspired canopy, lack of locator pins, iffy decals, sandpaper smooth surface texture – shall I go on? Needless to say, it is far from ideal. It is also the only game in town for this important fighter in 1/48th scale. On top of starting with a less than top shelf kit, I wanted to model the fighter version. Some additional surgery had to be done. I had planned this project for some time; gathering photos, structural drawings, color references, and squirreling away parts I knew I would need. There were several kit parts that needed extensive modification for the conversion. First, I added the guns, detail, and gun blisters to the engine cowl. Once this was complete, I thinned the pilot’s seat back and headrest armor by 75% to get them closer to scale. I trimmed down one of the kit-supplied s kis and used it as a cover behind the pilot’s seat. I added a radio box on top of this cover. The kit-supplied elevators had no hinge scribing on the lower surfaces, so I scribed the missing detail. The wing root ducts were honed out as well. I drilled out the exhaust stacks and the small oil cooler inlet just below and behind the prop spinner. Finally, I drilled out the sight glasses for the wing tanks. She was ready for construction. Per the usual, construction began with painting and detailing the cockpit. RLM 02 was painted throughout. I brush-painted the cockpit details and gave the interior a thin black wash. Once the wash had dried, I drybrushed the interior with a slightly lighter shade of gray green. I added the Eduard photoetched seatbelt for the pilot’s seat. Though there are no locator pins, there are no real hitches in construction. I did leave out the engine since it only causes problems. The rest of the airframe built up without drama. Several sessions of adding putty, Mr. Surfacer and sanding followed. As the final step in preparation for paint, I added the Squadron vac. canopy. I am not very comfortable with vac. canopies, but the kit canopy is junk! The clear parts were dipped in Future prior to assembly. I used Tamiya tape to mask the clear parts. It is extremely difficult to find a good picture of a Yak-7B with distinctive markings. After lots of searching, I came up with a great black & white photo of Lt. Col. A. E. Golubov laying on the wing of his Yak-7B. 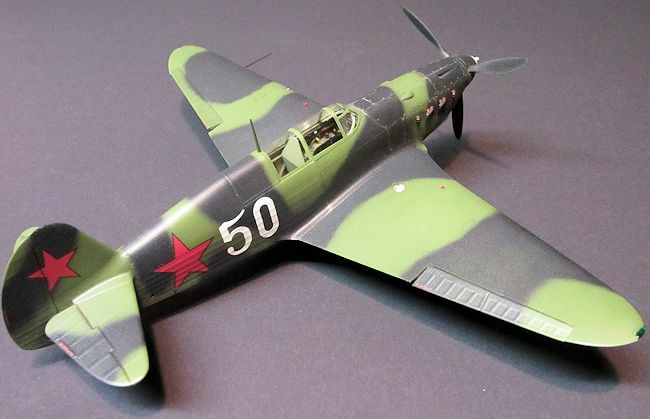 The photo clearly shows a Yak-7B in standard black/green/blue camouflage with a white spinner and large white “50” on the fuselage. All paints used in this build were Polly Scale acrylics. RLM 02 was sprayed on the canopy framing, landing gear doors, and landing gear. I painted U.S.S.R. underside blue on the lower airframe and masked it off. 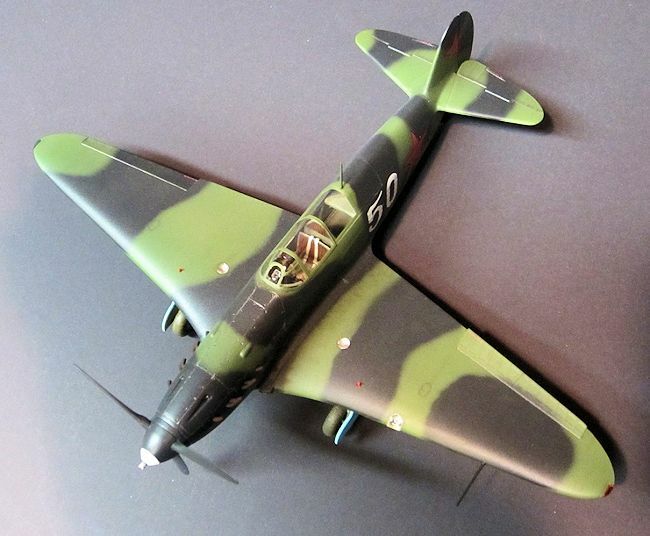 Then I sprayed Aircraft Interior Black, and U.S. TAC Mid Green (FS34102) freehand in the standard Yak-7B camo pattern. I used a variety of decals for this one, all from the spares box. After weathering the decals, I gave the plane a final flat clear coat. The landing gear, prop from an ICM LaGG 3 (The kit prop is junk), and other final bits were added at this time. Final detailing was then completed. It was a fun challenge to see if I could turn this into a real kit – one that I could display alongside a Bf 109 on the shelf. I’m pleased with the results. The extra effort made a vast improvement to a basic kit. I now have a nice-looking Yak-7B on the shelf. I appreciate ICM’s line of Yak fighters. They are at least a starting point for this great series of fighter aircraft. Until another manufacturer steps up to the challenge, the ICM Yaks 7 through 9 are the only game in town.